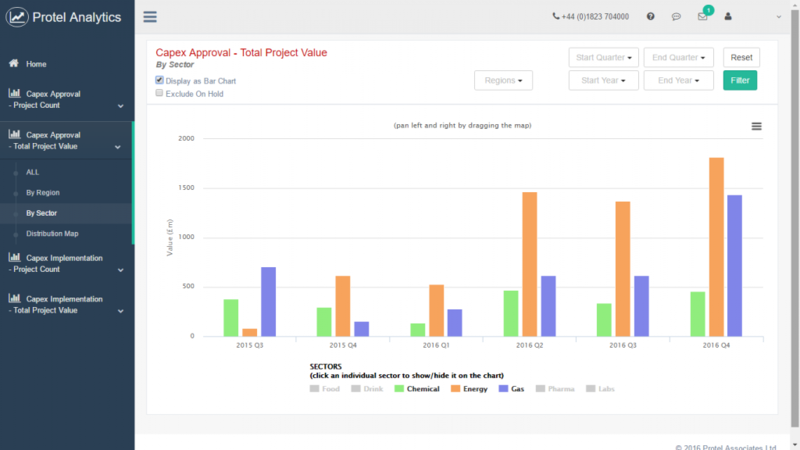 Our powerful capex project analytics portal packages Protel engineering project bulletin data into an easy-to-use statistical system. Get the data you need to make better business decisions. Protel Analytics gives you the insight to turn investment statistics into actions. Looking to allocate sales resource? Spot investment trends by region and sector to get ahead of the competition. Board meeting coming up? Use our statistical information to inform your business development strategy and add weight to your conclusions. Want to analyse the market? Easily track trends in average project size by region and sector. Get access to the toolkit that no process industry professional should be without. As the modern sales environment becomes more competitive it is vital for suppliers of capital equipment and services to be ahead of the competition. The live project statistical data available covers our main industries. Protel provides us with a user-friendly system for lead generation, which enables our sales professionals to gain information about projects in one of the core segments we’re working in. The service provided by Protel offers real value and data we can count on, while the support team is friendly and efficient.